The only thing familiar about the All-Star Race was the track, and the winner. Everything else, completely different. 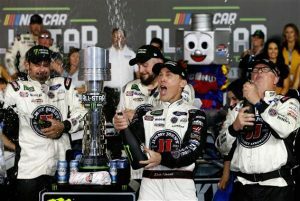 Every year when it comes time to have NASCAR take a break from points racing and instead just do an outright dash for a paycheck, it’s a race that in recent times has a lot of build up, only to be let down. Last year, what NASCAR decided to do was give teams an “option tire” from Goodyear, which was a softer compound than the normal tire that they were bringing. The tire increased grip, and speed. Teams could use it at any point, but if they decided to put it on for the final run to the end, they had to start at the back. Smart idea, but every team used the option tire, which had green lettering to tell the difference, and elected to use them before the final stage. This is a race that in 1985, in its first year, saw a driver take the checkered flag, and mere seconds later saw his engine explode. In 1992, this race went under the lights, saw a last-lap pass for the win, and the winner ended up in the wall, then the hospital the same night. Five years later, a car that was built to specs for the NASCAR rule book, but was different than any car that had ever been done before, blasted the field beyond any stretch of the imagination. Later that night, the team was told that the car was legal for that night, but wouldn’t be the next. In 2001, the race went green…and it immediately rained. No laps were recorded, so rather than ruin the night, the backup cars were pulled out for the teams that wrecked, and in the end a team that originally wrecked out…won out, with that backup. NASCAR had to figure out something to make the race in 2018 exciting. What they did was look to the under card, the lower tier series, and take a rules package that was tried out last year for one race, and saw success. The changes made: a 2014-style front splitter, with that same year air ducts, but with a 2018-style radiator pan for cooling. Out back, the spoiler was increased to a height of six inches, and also was equipped with “ears” on either corner, making each end of the splitter to nearly eight inches high. The biggest addition…a restrictor plate, normally used on the cars at Daytona and Talladega, was bolted on the engine. All this was to create better green-flag action, and more excitement. In the end…it did just that. For what ultimately was 93 laps, longer than the scheduled and advertised 80 thanks to the rule that no stage was ending under caution, the teams were wide open the entire way around the 1.5-mile speedway, making passes every which way they could. In all, there were 38 passes under green-flag conditions in the 2018 All-Star Race. A year ago…there were zero. That is not a mistake, there were no passes under green-flag conditions in this race a year ago. Social media was happy with this rules package, and although it was for one race, it showed promise, because it was experimental, and everything fell right into place for an exciting night of racing. Will this be used later on is uncertain, but for one race, this worked out incredibly well. A strong start and a great way to inject more excitement into a race that was not enjoyable for a few years.